As your business grows, you need to look professional to your clients and customers in all respects. If you’re still filling out sales receipts by hand, upgrade to professional sales receipts with this Excel sales receipt template. Download this Excel Sales Receipt today! For transactions that don’t require an invoice, this sales receipt is perfect. It is convenient and easy to use, yet still provides enough space to record all the information you need about your company and your customer. Simply fill in the details about your company (including your logo), your customer’s information, and the details of the transaction. In just a few simple steps, this professional sales receipt template helps you create a receipt that will make a positive impression on your customers. 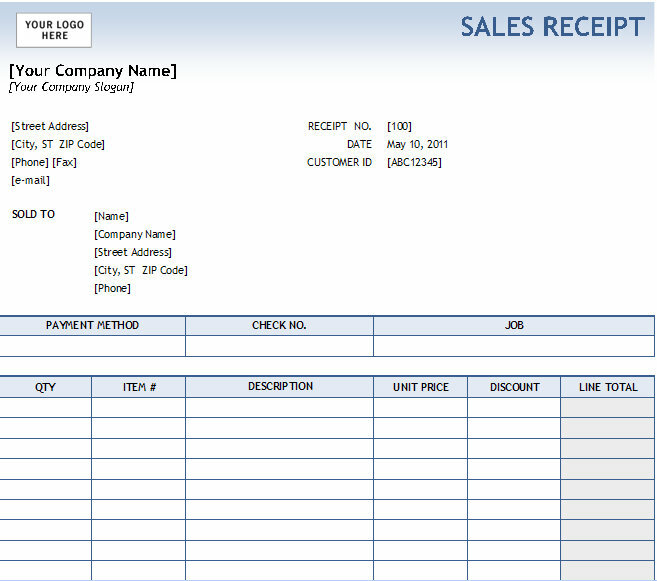 Combining a polished appearance and ease of use, this Excel template will increase the quality of your sales receipts. Though it may seem like a small thing, producing professional sales receipts can help your clients see your company as more trustworthy. Have you used this template? Great! Tell your friends about it via Facebook and Twitter, so they can try it, too. Our site is always expanding and adding new templates, so don’t forget to check back soon to find other ways we can simplify your life.